Winter is quickly approaching but it isn’t too late to get an adventure slotted in this autumn. For that matter, we run our adventures all year round and some winter days are more fun and even more beautiful than summer! We have a simple solution, move quickly but safely, keep groups smaller and wrap up warm with our nice new wetsuits, thick gloves, socks and waterproof overcoats, a winning combination. For stag and hen groups, white water rafting is a brilliant option and runs best in the winter when river levels are nice and rowdy… We offer excellent rates for Newcastle based stag and hen groups that book a full package, including accommodation, adventures and bar crawl. Get in touch here to find out more about our stag and hen packages. Hopping into the hole on Ashgill Beck. 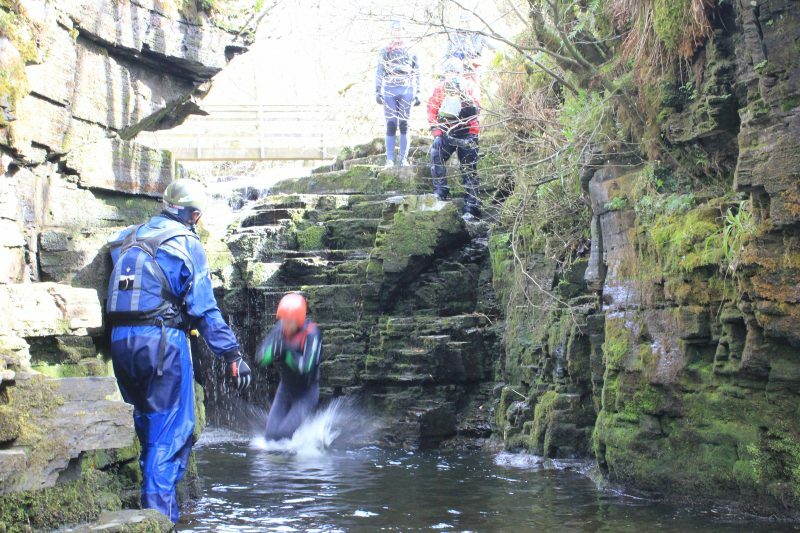 Going forward to the winter we have some canyoning and via ferrata Xtreme spaces available on our open sessions too. These are a brilliant way to get out with us but no need to have a larger group, couples, individuals and small groups are all welcome. You can check out the availability here. Don’t worry if there isn’t a date online, the 2018 dates will be live soon and if you get in touch we will do everything we can to make your adventure happen whether it’s in the calendar or not. Just like last year, we are continuing the early bird special; those planning in advance are rewarded by stag or hen goes free when the deposit paid in December. This offer is for anyone or group on any of our activity options: open sessions, vouchers, stag or hen, booking for special occasions and team building days. Get in touch here to find out more. We have some awesome plans for the new year with a new activity coming to fulfill your adventure needs in early 2018. Its called coasteering and involves traversing a technical route along the coast, normally involving big jumps, sump dives, island sea crossings; all while the waves try and take over and knock you into the sea. There will be a level for everyone, from the need to be super brave to a more relaxed coastal traverse. As always we can gauge everything we do to suit each group and we always aim to make sure people get the most out of every trip with us. See you on your next adventure!